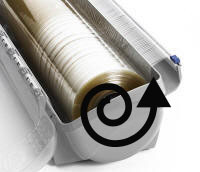 Pull film or foil over the slide cutter or blade and Close the lid. 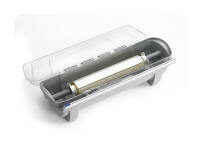 The slide cutter's surface helps keeps plastic wrap/film in place for the next use. 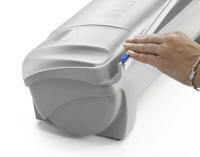 For best results keep the slide cutter surface clean. Use only a clean damp towel. Do not scrub with abrasive pad or cleanser. Operate the Kenkut 3 at normal table height at least waist high or wall mounted. Remove cutting blade and slide cutter when washing Kenkut 3. Machine washable.